Amazing Commercial Terrazzo Floor Restoration Bristol. Have you just discovered a terrazzo or concrete floor in your commercial property or place of work and want to know about our commercial terrazzo floor restoration Bristol, Bath and the Southwest as you are considering your options what to do with it? Whatever you do please do not just hide it away again. Set the beauty free! It may look dull and lifeless now but with our commercial terrazzo floor restoration Bristol service your terrazzo or concrete floor will look so stunning once again. If you have commercial terrazzo flooring restoration from CleanAndSealUK you can rest assured that your terrazzo floor will be treated with the utmost respect it deserves. Commercial Terrazzo Floor Cleaning Bristol And The whole UK. CleanAndSealUK have cleaned some of the best commercial terrazzo floors in the country and want to clean yours too. Wherever you are in the UK, don’t think your terrazzo floor is to far away from one of our commercial terrazzo floor cleaning technicians. It isn’t. CleanAndSealUK commercial terrazzo floor cleaning technicians cover the whole of the UK! Fill out the enquiry form and tell us about your commercial terrazzo floor cleaning requirements. If you’re looking for a high sheen mirrored finish to your terrazzo floor then contact CleanAndSealUK. We only use the best commercial terrazzo floor polishing equipment available. We have sourced throughout the world the best diamond grinding and polishing tools to make your terrazzo floor polishing experience only the very best. Our commercial terrazzo floor polishing Bristol service comes with a 100% money back guarantee. So if you’re not happy with our commercial terrazzo floor polishing Bristol service, you don’t pay. We are so confident about the result of any type of floor polishing service we do. That’s why we are giving you this great offer. Protect Your Commercial Terrazzo Floor With Terrazzo Floor Sealer. To protect your commercial terrazzo floor from spillages and dirt, make sure you have your terrazzo floor sealed. It’s so easy to etch a floor that has not had a sealer applied. Our Commercial terrazzo floor sealer is the best out there. You can find terrazzo floor sealer on our stone floor cleaning and sealing products page. Don’t let your terrazzo floor fall foul of the acids and harsh chemicals used everyday by other commercial cleaning companies that can ruin the look of your beloved terrazzo floor. 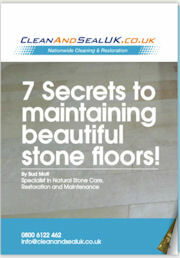 Contact CleanAndSealUK to discuss having your terrazzo floor sealed.